I spent quite a few hours on Saturday, 26 March, walking the streets of London fairly slowly with approximately half a million other people. Some of the time I carried a flag, for a short while I help carry the national banner of my union, the National Union of Journalists. When I finally got to Hyde Park, some friends and I walked down towards Victoria Station to find a pub for a much needed drink, then my partner and I went and got some food and finally home, exhausted. That was probably like the experience of most of the rest of the 500,000 marchers at the TUC’s long-awaited March for the Alternative. Amongst those who walked themselves to exhaustion and then went hope were probably quite a number of other anarchists like me. That’s not the how the media decided to portray the day or anarchists . Oh no, half a million people peacefully walking together to show their opposition to the cuts is less of a story than a few broken windows. The date of 26 March has, for months, been a date in every activists’ diary. Numerous groups were making placards, my union got loads of new flags made and some groups were planning to do more than simply walk up the road and go home. It’s very important to distinguish between some of these different groups – something more than a few media outlets have not been willing to do. UK Uncut don’t break windows or spray-paint anarchy As on the walls. I’ve reported a few of their actions and they’re a polite and peaceful bunch of fluffy activists who like to sit on the floor in Top Shop or outside Vodafone to make their point. According to reports, when they occupied Fortnum & Mason, they sat around, sang songs and read poetry. Then there’s the “black bloc” group, except it’s not a group, it’s a form of tactical organisation. Black blocs came to promimence with the convergence demonstrations around 10 years ago in the global justice or “anti-globalisation” demonstrations. It means people dressing in black, masking up and sometimes engaging in some property damage and fighting the cops. 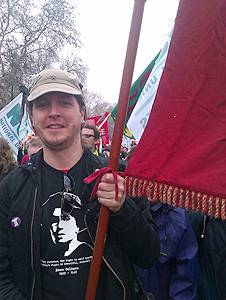 It’s primarily a tactic used by some anarchists – highlighted by the red and black anarchist flags many carried. Today saw a considerable number of largely young (some very young) dress up and do all the things expected of the black bloc, much to the delight of the UK’s broadcast media (and presumably the ‘papers too). Hundreds of thousands of people walking peacefully – an inspiring mass of colour and diversity – isn’t a story, a few broken windows and paint-bombs is. Accusations and condemnations will fly in the coming days, talk of infiltrators, violence and criminals. And there will probably only be a few lone voices who will point out that there is real anger out there and a palpable sense of powerlessness. Half a million people marched and will probably be ignored. Is it any surprise that an increasing number of young people decide to act out? Many of these are probably veterans of the student demos – kettled, batoned, charged once, twice, three times. This is not to defend their actions. I’m not interested in defending or condemning what they did. I’m much more concerned with the reality that this kind of activity will only increase because these kids see no alternative. Much of the trade union movement has spent over a decade living in complacency as the numbers of people in trade unions continued to decline. The unions are nowhere near the position of strength they held before Thatcher launched her onslaught. Too many unions saw mergers instead of recruitment as a way to consolidate their power. Many of these angry young people will be unemployed like many young people in general. But, for those who enter the workplace, they’ll probably find themselves without the protection of a trade union, being exploited for minimum wage with no security. Getting nearly half a million people on the streets is impressive, but it’s not a reason to pat ourselves on the back. Every one of those people should try to recruit one person they know to a union – any union. If the government ignores today’s march, then seeing the numbers of people in trade unions suddenly jump by 500,000 would really make an impact. It will also mean that we have much more strength when we start the wave of co-ordinated industrial action the government has made inevitable. And finally, for those who condemn the black bloc for “violence”, talk to someone who was partying in Trafalgar Square as night fell on 26 March. The police showed them, once again, where the real violence in society is. The police, who will protect banks and shops with full force, but will do nothing to defend libraries or hospitals from the government’s far worse vandalism. The police, who with truncheon and shield, showed every protester left in the city that the state has the monopoly on force. The police, who have been congratulated by some and criticised for not going far enough by others, proved once again that people are worth less than property in the UK – heads are worth less than windows. Yes. This more or less precisely reflects my experience of the day. I agree that anger and powerlessness is expressed by the window smashing. Born out of frustration with political and economic systems not fit for purpose. Understandable, but counter-productive, because the media are not discussing the cuts, they’re discussing window-smashing and new laws to repress future demos (terrorist stop & search powers). Violence, even against property, is the problem, not the solution. I make exception for the excellent Trident Ploughshares action, especially Angie Zelter’s destruction on the Hawk ground attack exercise, subject of a spine-tingling songby the equally excellent Seize the Day. Like many others, I have spent 30 years in political activity opposing the insane cognitive framework that underpins our dysfunctional economy and politics. I have taken part in a modest amount of direct actions, and have been arrested once for lying on the access road to Faslane, home to UK’s WMD. Non-violent Direct Action requires long careful planning, including consideration of the law of unintended consequences. It is also a central belief that we must take responsibility for our actions and if necessary justify them in court. As Angie Zelter did, and got a Not Guilty verdict. Kicking plate glass windows in is a kind of mental short circuit. There is a total rejection of everything political, even the Green Party, which, for all its shortcomings, is at least trying to put forward an reasoned alternative to George Osborne’s chainsaw attack on the best bits of our State. It is ironic that those who seek to smash the state window by window share a common aim with Osborne, who seeks to dismember the state cut by cut. I wouldn’t mind so much if at least direct activists would spare 5 mins of their valuable time to step in to the polling booth and give the Green Party a tiny bit of support. Not too much to ask is it? Yes, it is, because the Green Party is tainted by the very act of seeking to use such democracy as we have in the UK. And of course it is middle class bleeding hearted liberal repressive tolerance &c &c.
So all avenues are closed, in the mind of the BlackBloc. Window-smashing is the only valid political option in their framework. For the life of me, I cannot find any merit in that argument. It’s counter productive nature is one of the clues that convinces me that they are well infiltrated by undercover cops. Yes and no. I’m all in favour of debate within the movement, and I’ve criticised the use of the black bloc tactic in the past, and no doubt will do again, but it should be recognised that these debates do not take place in a vacuum. At a time when the media and state are viciously attacking those anti-cuts activists who used the black bloc tactic, our first response should be to show our solidarity with them. The best time for tactical debates is in the run-up to big protests – in the polarised atmosphere of the immediate aftermath of a demo, it’s difficult to get nuanced criticism across. Does that make sense? I hope I don’t come across as wanting to censor criticism of the black bloc, I think such criticism is totally legitimate and vital to any healthy movement, I just think that right now solidarity should be a higher priority than criticism. Sorry Richard, but I’m Irish. The argument that the Green Party will be any different when they get power sounds hollow to me after seeing your Irish equivalents sell their souls over the past few years. re Comhaontas Glas: Touche’. Lesson learned: never get into bed with the Conservatives. I agree with your post. A march from A to B which can garner so many people is impressive but won’t change much certainly with our unimpressive trade union bureaucrats at the helm. Barber will be pleased with himself. But if we are to take on and fight the cuts then the strategy has to include non-violent direct action, occupations and strike action. I was at Piccadilly and people cheering on the protesters on F&M roof weren’t just so-called hoodie wearing masked up young people but a whole host of different age ranges. Some were indeed trade union activists stopping to watch as the end of the march was moving through Piccadilly. And I saw the violent brutality of the cops, using their shields as weapons, witnessing people with bloody faces and concussion. And it wasn’t just young people confronting the cops, I saw a group of 50 somethings remonstrating them re the violence and brutality. But then the media does like to be selective in its reportage and knee jerk reactions (and bearing in mind this is the first week of the inquest into the death of Ian Tomlinson).